I have a history of fading over the course of training camps. My experiences on Epic Camps support this – start strong, but slowly lose my place in the rankings as the week progresses. There was no points game in Lanzarote, just the data from Powertap files and the satisfaction of making it to the top of a climb first. But in a break from tradition my numbers rose and my climbing improved over the fortnight. It helped that I eased into the camp, the first week was lighter than on previous trips. A single long ride with the others moderate in distance if not effort. Combined with good control of diet around hard training I set myself up to perform. It was more by chance than design as Steven started the trip sick. I’ll learn from this; there is a lot to be gained from building into a camp. Daily swims remained the routine through the second week. Each day I covered between two and four kilometres in loops around the Ironman course. The results soon showed, I regained some of that elusive ‘feel‘ for the water. It’s hard to be precise, but my catch and timing seemed more effective and I found myself swimming faster. It remains true that my best swim performances form off the back of a lot of regular swimming. A fortnight of consistent training has worked. I can’t speak so positively about running. The first week went smoothly with a series of short runs building my confidence. My legs held up despite the growing fatigue from cycling until Monday set me back. I ran with Steven and Jo, turning after fifteen minutes as Steven went on, the pace picked up and I found myself at a speed I’d not run at in a while. Foolishly I carried on even as I felt my left calf twinge. I enjoyed running faster than usual, but paid the price when I stopped; my left leg tightened again and whilst not severe I recognised the signs. My consistency was broken. Afraid of aggravating the issue I held back from running on subsequent days. Running remains so inconsistent that it’s hard to see where I’m going. I have six or seven weeks to reach a point where I feel comfortable I can complete the Outlaw marathon without causing further harm. I need to prioritise this and genuinely deal with the issue. It’s drawn out and it’s time to consider external advice. I may have success with my biking, but until I restore my run form I will not race well. There are no prizes for reaching T2 first. Cycling was good, very good. 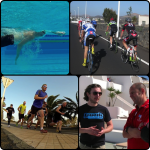 It’s the main reason to train on Lanzarote, the quality of work I perform there is rarely achieved elsewhere. Steven and I were evenly matched in bike strength so there was a clear opportunity to push each other. Each of us played to our differing strengths – Steven taking advantage of his aerobars and using the flats and downhills to leave me behind, with me attacking on the hills and powering up climbs. We rode hard, taking turns on the front and setting the pace, there was rarely an easy moment. Games were played as we tried to take advantage of those strengths. During our second Ironman Plus ride Steven gapped me on the lead in to Haria. By the time I reached Los Valles he’d opened a kilometre and could safely crest the top long before me. I would not make that mistake again and attacked early on the way to Mirador del Rio, ensuring he couldn’t escape me on flatter terrain; if we were together at the final climb, I had him. The tactic worked and I reached the summit first. Every ride we pushed each other in this way. The highlight of the camp was testing the Ocean Lava 70.3 course. A mix of climbs at the Southern end of the island, including the steep side of Femes. We were under pressure to perform as we’d been hyped to Tri Londoner Tomas who had joined us for the ride. Convinced he’d suffer he sat on our wheel the entire route as we pushed the pace over the series of climbs. The wind had picked up – an early indication of conditions on race day – giving Steven the advantage when he used his aerobars up Timanfaya. I opted to set power PBs as I chased. Suitably motivated this ride proved to be the strongest of the camp. The weekend brought the Ironman, a rest day as I spent my time spectating and filming the race. Plans I had to train after were lost as those who raced relaxed. It was too tempting, I only managed to swim each morning. I accepted that training wasn’t going to happen and viewed the last three days as recovery from the work before. The camp was less extreme than some of my previous efforts, but hard enough that I needed some downtime. Taking the recovery days then allows me to return to training sooner. Lanzarote was once again the perfect venue for a camp. I was able to put in some quality work on the bike and am pleased to have made progress with swimming. These are things I need to carry through into my regular routine. I started the year grumbling about the lack of camps on my schedule, but this month I’ve added two to the calendar. June will finish with a trip to Pyrenees Multisports for their Iron CAMP, then August will be the real test as I’ve signed up for Epic Camp France! Such a successful camp along with watching the Ironman has fired my enthusiasm. I feel the need for another forty days of biking to help me take my cycling further and prepare for some tough mountains. My plans are long term, if I can keep building the way I am then 2012 is going to be a fine year. Time to enter Ironman Lanzarote and set one of my goals. Copyright © 2007 - 2019 Russell Cox. All Rights Reserved.